Yemenite commentator and poet of the fourteenth century; author of a homiletic commentary on the Pentateuch entitled "Nur al-Ẓulm wa-Maṣbaḥ al-Ḥikm." The first notice of this work was given by Jacob Saphir ("Eben Sappir," i. 67a, Lyck, 1866), who saw a manuscript of it at Ḥirbah, a small town in Yemen, in 1863. But the beginning of the manuscript was missing, and Saphir's statement that the author's name was Isaiah and that the title was "Al-Nur wal-Ẓulm" depends only upon hearsay. Two other manuscripts, one in Berlin (Steinschneider, "Verzeichnis," p. 62) and one in the Bodleian Library (Neubauer, "Cat. Bodl. Hebr. MSS." No. 2463), bear the author's name, Nethaneel b. Isaiah, and the full title of the work, "Nur al-Ẓulm wa-Maṣbaḥ al-Ḥikm wa-Ikhraj al-Ma'ani fi al-Wujud Ba'd al'Adm." Alexander Kohut published a monograph on this work, giving some extracts, under the title "Light of Shade and Lamp of Wisdom" (New York, 1894). This title is given by Kohut as the translation of the Arabic title, though "Light out of Darkness" would be a more fitting translation, since Nethaneel's introduction shows that his object wasto comment on the obscure passages so as to make sure that their meanings should not escape the student. 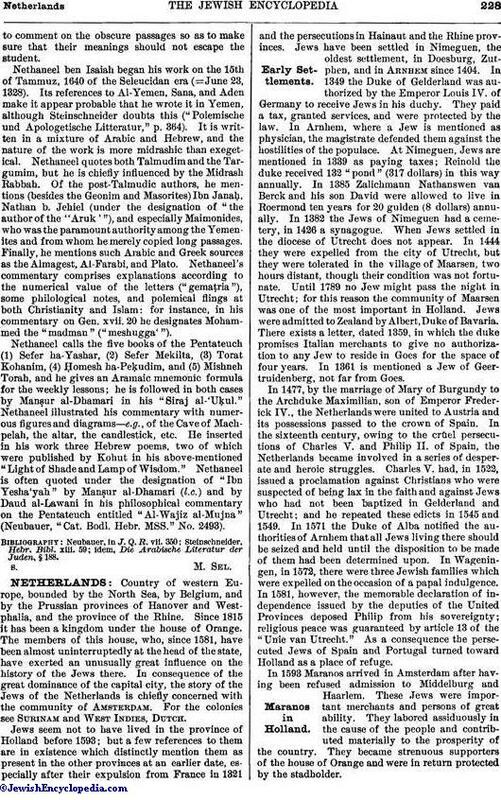 Nethaneel ben Isaiah began his work on the 15th of Tammuz, 1640 of the Seleucidan era (=June 23, 1328). Its references to Al-Yemen, Sana, and Aden make it appear probable that he wrote it in Yemen, although Steinschneider doubts this ("Polemische und Apologetische Litteratur," p. 364). It is written in a mixture of Arabic and Hebrew, and the nature of the work is more midrashic than exegetical. Nethaneel quotes both Talmudim and the Targumim, but he is chiefly influenced by the Midrash Rabbah. 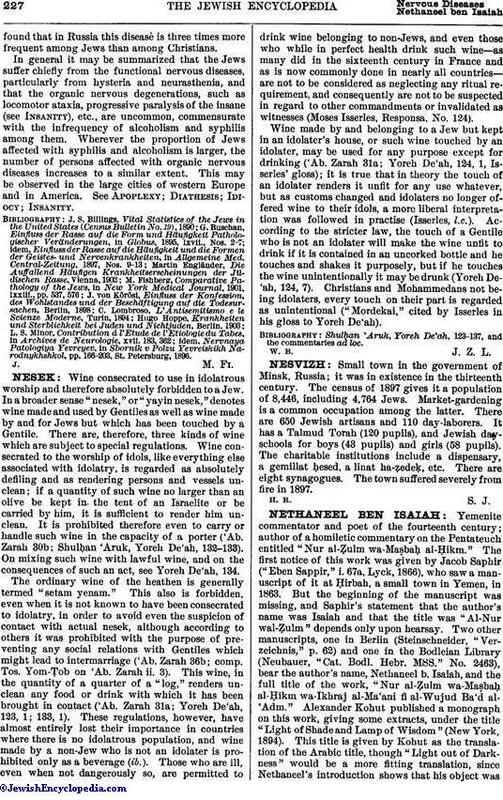 Of the post-Talmudic authors, he mentions (besides the Geonim and Masorites) Ibn Janaḥ, Nathan b. Jehiel (under the designation of "the author of the "Aruk '"), and especially Maimonides, who was the paramount authority among the Yemenites and from whom he merely copied long passages. Finally, he mentions such Arabic and Greek sources as the Almagest, Al-Farabi, and Plato. Nethaneel's commentary comprises explanations according to the numerical value of the letters ("gemaṭria"), some philological notes, and polemical flings at both Christianity and Islam: for instance, in his commentary on Gen. xvii. 20 he designates Mohammed the "madman" ("meshugga'"). Nethaneel calls the five books of the Pentateuch (1) Sefer ha-Yashar, (2) Sefer Mekilta, (3) Torat Kohanim, (4) Ḥomesh ha-Peḳudim, and (5) Mishneh Torah, and he gives an Aramaic mnemonic formula for the weekly lessons; he is followed in both cases by Manṣur al-Dhamari in his "Siraj al-'Uḳul." Nethaneel illustrated his commentary with numerous figures and diagrams—e.g., of the Cave of Machpelah, the altar, the candlestick, etc. He inserted in his work three Hebrew poems, two of which were published by Kohut in his above-mentioned "Light of Shade and Lamp of Wisdom." Nethaneel is often quoted under the designation of "Ibn Yesha'yah" by Manṣur al-Dhamari (l.c.) and by Daud al-Lawani in his philosophical commentary on the Pentateuch entitled "Al-Wajiz al-Mujna" (Neubauer, "Cat. Bodl. Hebr. MSS." No. 2493). idem, Die Arabische Literatur der Juden, § 188.